The combination of machine learning, deep learning, natural language processing, and cognitive computing will change the ways that humans and machines interact with our environments. Artificial intelligence (AI)–driven smart services will sense one’s surroundings, know one’s preferences from past behavior, and subtly guide people and machines through their daily lives in ways that will truly feel seamless. This quest to deliver AI-driven smart services across all industries and business processes will usher in the most significant shift in computing and business this decade and beyond. Firms can expect AI-driven smart services to impact the future of workflows, Internet of Things (IoT) services, customer journeys, and blockchain distributed ledgers. 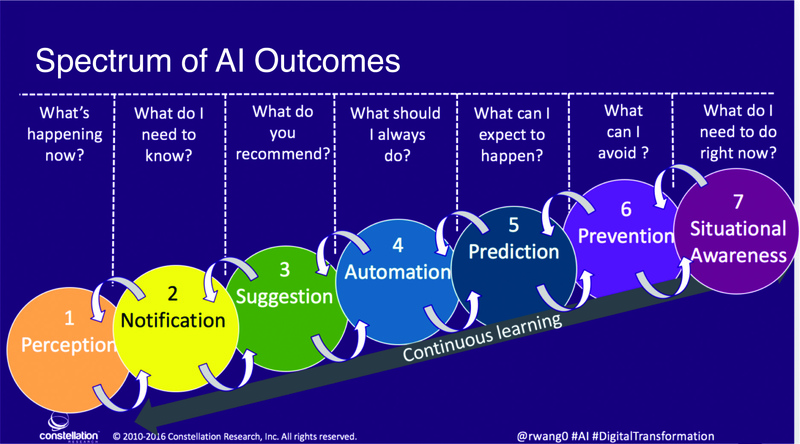 Their success requires the establishment of AI outcomes (see the chart below). Once outcomes are established, organizations can craft AI-driven smart services that orchestrate, automate, and deliver mass personalization at scale. Crafting AI-driven smart services requires a shift in thinking and relies on these five key components. 1. Digital footprints and data exhaust are used by AI to build anonymous and explicit profiles. Every individual, device, or network provides some information. That digital footprint, or “exhaust,” could come from facial analysis, a network IP address, or even one’s walking gait. Using AI and cognitive reckoning, systems can start to analyze patterns and correlate identity. That means that AI services will recognize and know individuals across difference contexts. 2. Immersive experiences enable a natural interaction. Context, content, collaboration, and channels all come together in AI-driven services to deliver immersive and unique experiences to each individual. The services will use context attributes such as geospatial location, time of day, weather, heart rate, even sentiment—combined with what the service knows of our identity and preferences—to improve relevancy and deliver the appropriate content. Sense-and-respond mechanisms will enable collaboration between participants and machines through conversations and text dialogues. The channels will include all interaction points—mobile, social, kiosks, and in-person. The goal is natural user experiences based on identity. 3. 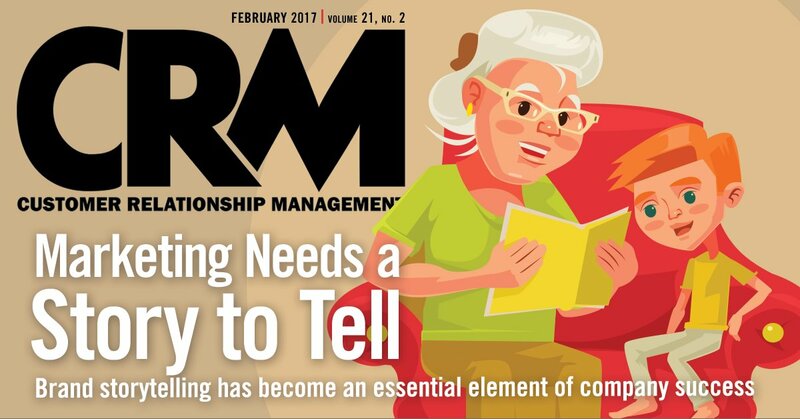 Mass personalization at scale delivers digital services. Anticipatory analytics, catalysts, and choices interact to power mass personalization at scale. With anticipatory analytics, customers will skate where the puck will be, to use a hockey metaphor. Catalysts provide offers or triggers for response. And with available choices built into the system, customers can make their own decisions. Each individual or machine will have their own experience in contexts depending on identity, historical preferences, and needs at the time. From choose-your-own-adventure journeys and context-driven offers to multi-variable testing on available choices, AI systems offer statistically driven choices to incite action. 4. Value exchange completes the orchestration of trust. Once an action is taken, a value exchange cements the transaction. Monetary, non-monetary, and consensus are the three common forms of value exchange. While monetary value exchanges might be the most obvious and familiar, non-monetary value exchanges—including recognition, access, and influence—often prove compelling. Meanwhile, a simple consensus or agreement can also deliver a value exchange—on the veracity of a land title, for example, or agreement on a patient’s treatment protocol. 5. Cadence and feedback continue an AI-powered learning cycle. Powered by machine learning and other AI tools, smart services consider the cadence of delivery: one-time, ad-hoc, repetitive, subscription-based, or threshold-driven. Using machine learning techniques, the system studies how the smart services are delivered and applies this to future interactions. Fears of robots taking over the world have seized the popular imagination, but the reality of our interaction with machines proves far less dramatic. Successful AI-driven smart services will augment human intelligence just as machines have augmented physical capabilities. By enabling reduction of errors, improving speed of decisions, identifying demand signals, predicting outcomes, and preventing disasters, AI-driven smart services will play a key role in defining business models for customer experience. In fact, Constellation expects that every CX journey will eventually follow an AI approach and build out the neural networks on top of established consumer graphs. Every brand and customer experience will move from automation to intelligence.